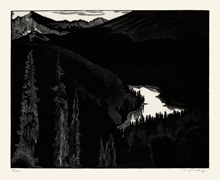 Vista Lake ---1932, Wood Engraving. Edition 200. Signed and numbered 2/200 in pencil. Boulet MBL 187. Image size 5 5/8 x 7 1/8 inches (143 x 181 mm); sheet size 7 1/2 x 9 5/8 inches (191 x 244 mm). 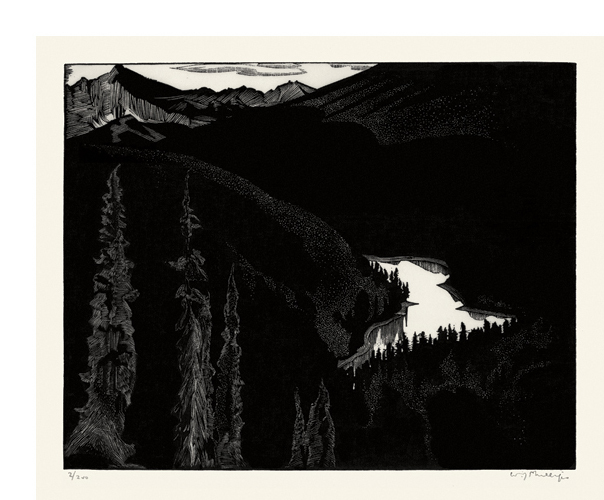 A superb, black impression, on tissue-thin cream Japan paper, with full margins (7/8 to 1 5/16 inches). Slight rippling in the sheet and minor creasing in the top left sheet corner at the original glue spot, otherwise in excellent condition. In the original Woodcut Society presentation folder. 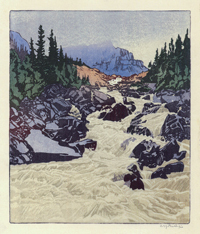 1932 Presentation Print, Second Publication of the Woodcut Society. Printed by Torch Press, Cedar Rapids. 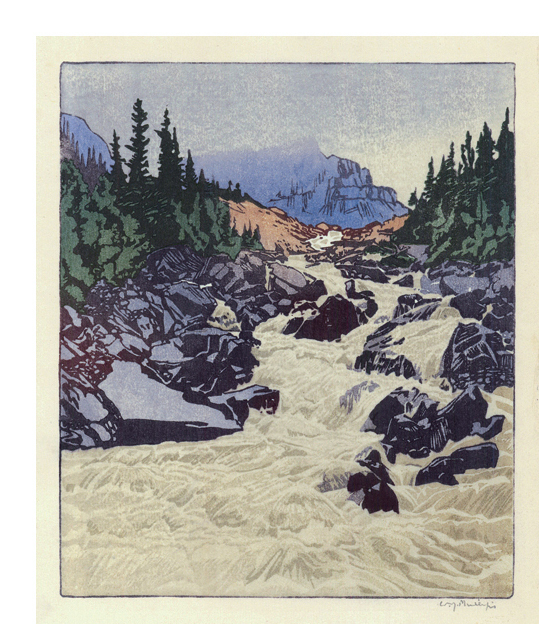 Above Lake Louise---1945, Color Woodcut. Edition 200. Signed in pencil. Boulet MBL 239. Image size 7 7/16 x 6 1/4 inches (189 x 159 mm); sheet size 8 1/2 x 7 inches (216 x 178 mm). A fine impression with fresh colors, on cream laid Japan paper, with full margins (3/8 to 1/2 inch), in pristine condition. In the original Woodcut Society presentation folder. 1945 Presentation Print, Twenty-seventh Publication of the Woodcut Society. Printed by Torch Press, Cedar Rapids.